Notes from the foster parents - I think it says it all about these Two Adorable 5 Month Old Lovebirds! Ok, you`re going to have to temper my comments about Drew and Carmen because on a cute, smart, tame, temperament scale of 1-10, these two are a 15! I gave them a day or two to settle in before I tried to handle them but they both step up and can`t wait to hop on my arm or shoulder and hang there, or if I set them down they will check things out or if I put them by the open door they will climb on the cage or go in. They ate the Nutra-An cakes the first day and will take them from my hand. Since I have no wing clipped birds I don`t know if these two are clipped or if their wings aren`t fully grown out but they can`t fly and sort of flutter to the ground. They like being misted and don`t back away. They aren`t doing much with their veggies yet but that doesn`t surprise me as all new fosters take a while to adjust to fresh food. Taxi and Basil jump around for their veggies now so I know these two will come around soon, especially because they are so young. I really have to give kudos to the people who hand raised them as their work has made these two as adoptable as any birds. They would not belong in a home who just want to watch and enjoy them and will blossom in a home where the family wants to interact with them a lot. It would be a shame not to hold out for this type of home. If we didn`t have dogs, they would be a perfect fit here. 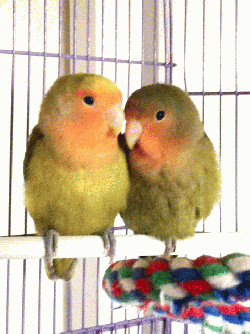 Please contact the Lovebird Coordinator at the link above if you are interested in adopting Carmen & Drew.